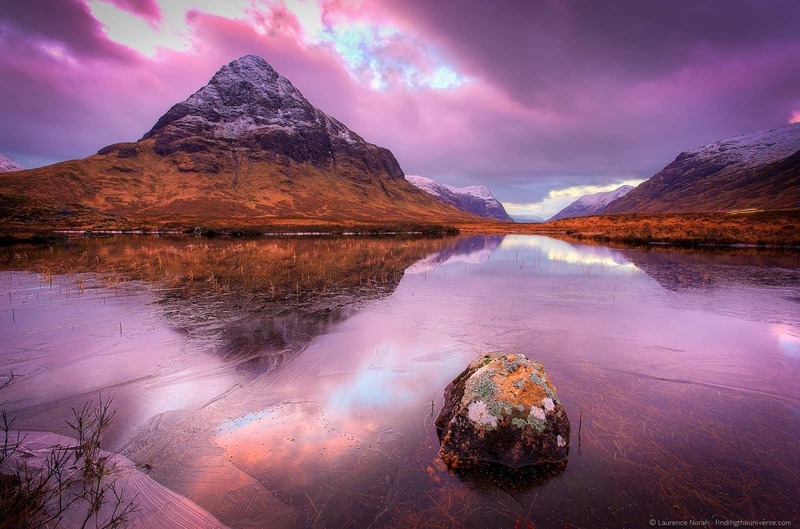 Glen Coe (also often referred to as Glencoe) is one of the most stunning and well known photography locations in Scotland. I’ve been lucky enough to visit and photograph this location a number of times, and I wanted to share some photos from my first visit to this location in the form of a photo essay. 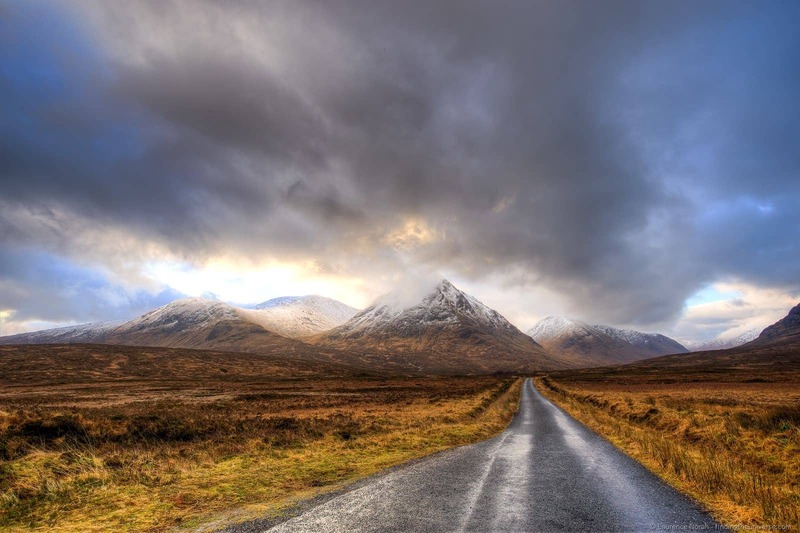 This trip happened in 2015, when I took a road trip with some fellow travel photographers up to the Scottish Highlands, and specifically Glencoe. 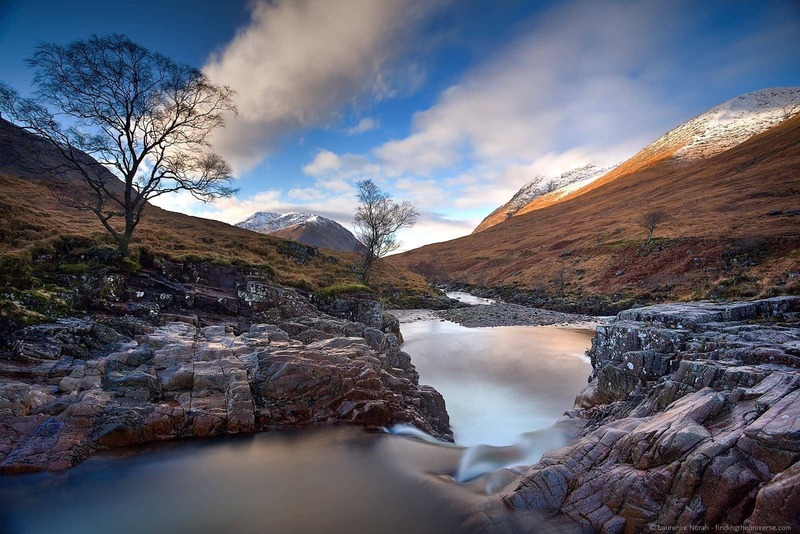 Marred with a tragic history, Glencoe happens to be one of the most spectacular locations for landscape photography that I’ve ever had the privilege of visiting. 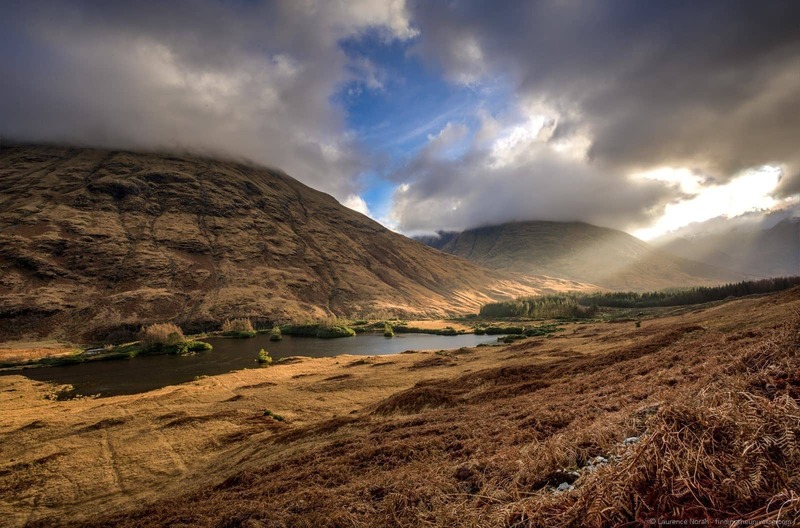 It’s also a well known filming locations, having appeared in films including Highlander, Skyfall and it was a filming location for many Harry Potter films. I was only in the area for a couple of days on my first trip, but I managed to get a fair few shots to give you an idea of why you need to fly to Scotland, hire a car, and just visit as soon as you can. Let me know if you agree by the end of the photo essay! 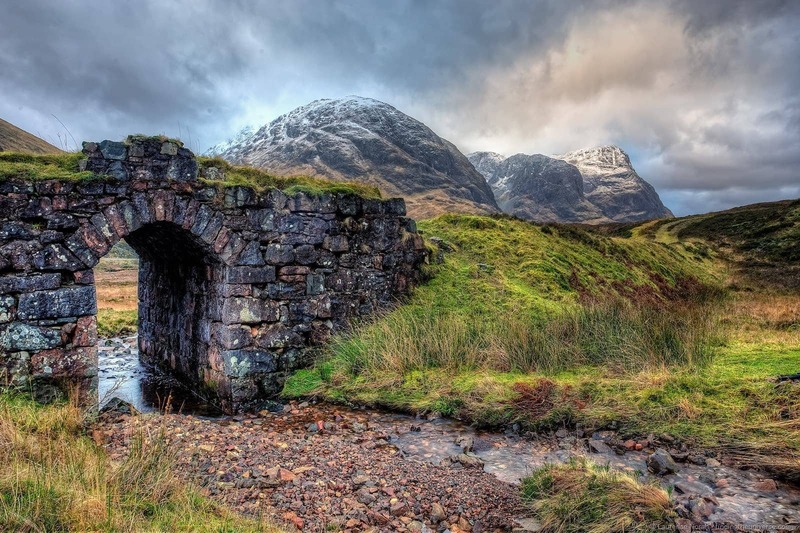 Glencoe is all about brooding peaks and a narrow, oppressive valley. Visiting in January meant I could have been unlucky with the weather, as it was I had two days of nearly perfect light, and a golden hour that seemed to last all day. I’m not complaining. There are countless hiking trails to take in the majesty of the area, if that’s your thing. I spotted this little trail and bridge from the road, and had to stop to shoot it. Those are the three sisters in the background. All those mountains and snow, not to mention the occasional spot of sideways rain and sleet, means of course that there are rivers galore. Here’s one of them in full flow! Did I mention the light was pretty special? 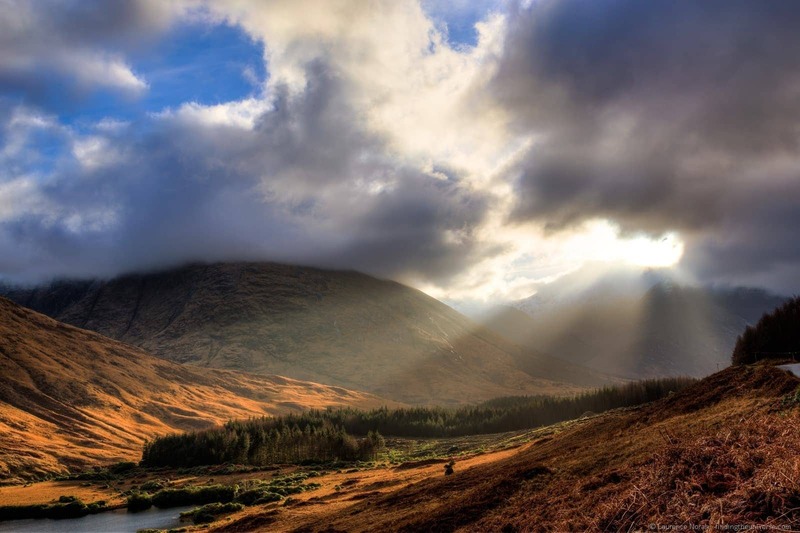 Here’s a shot of the light bursting through the clouds over one of the many lochs in the area. It just kept changing and getting better! Obviously you have to find a small cottage against a mountain to take a photo of. This one appeared to have been built specifically to pose wonderfully for photos. Here’s that bridge again, with the three sisters in the background. No trolls in sight, but I wouldn’t have been surprised to have found one. More waterfalls. It’s quite pretty here. And the same waterfall, looking the other way. It’s kind of hard to know what to shoot, it’s so scenic everywhere you look! And to finish off, one of my fellow travellers, Dante takes in the gorgeous scenery of the valley. You can find Dante on Instagram here. 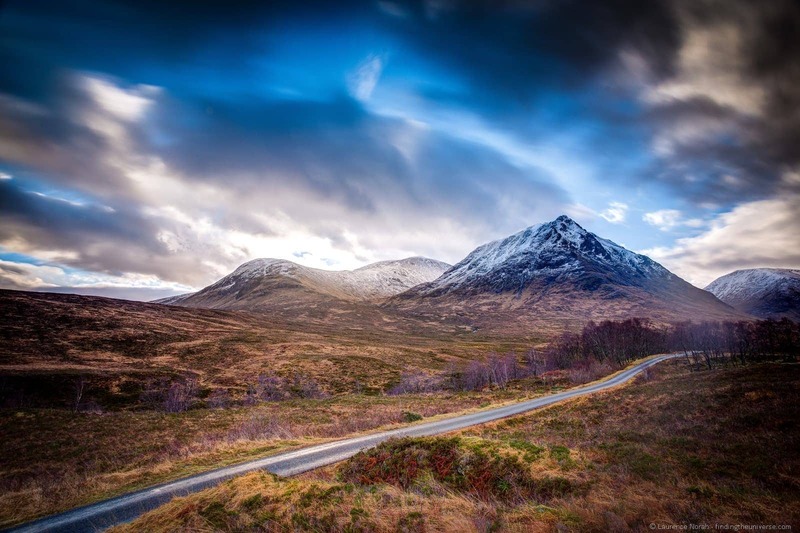 From a photographer’s perspective, Glencoe is easiest to reach by car, as it’s a fairly remote location and a car will give you maximum flexibility in terms of getting the right shot and hunting down the perfect light. It’s around a 2.5 hour drive from Edinburgh. 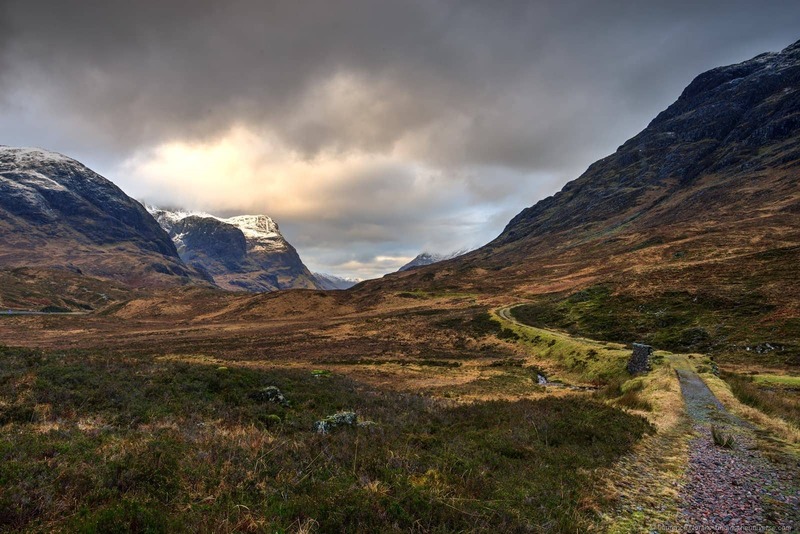 We’ve travelled extensively in Scotland since my first trip to Glencoe, and have put together a great many resources to help you plan your own adventures. Here are a few we think you’ll find helpful. 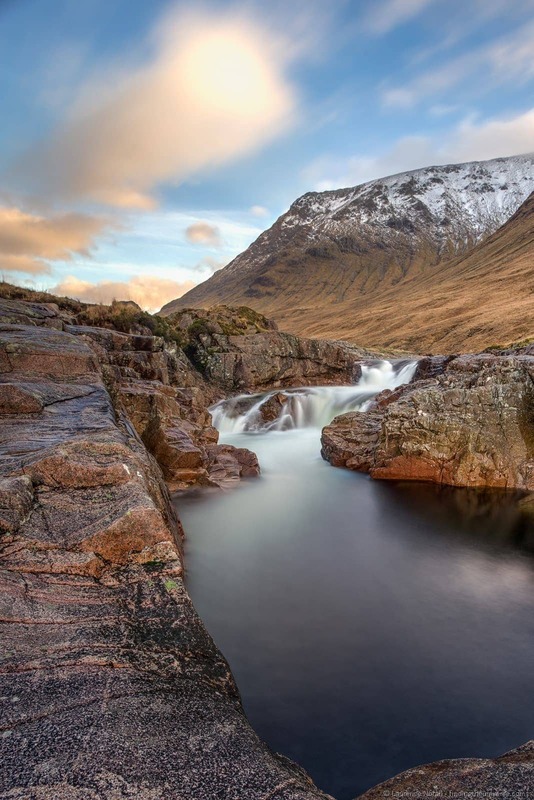 A guide to photography locations on the Isle of Skye, another of Scotland’s well known photo spots. 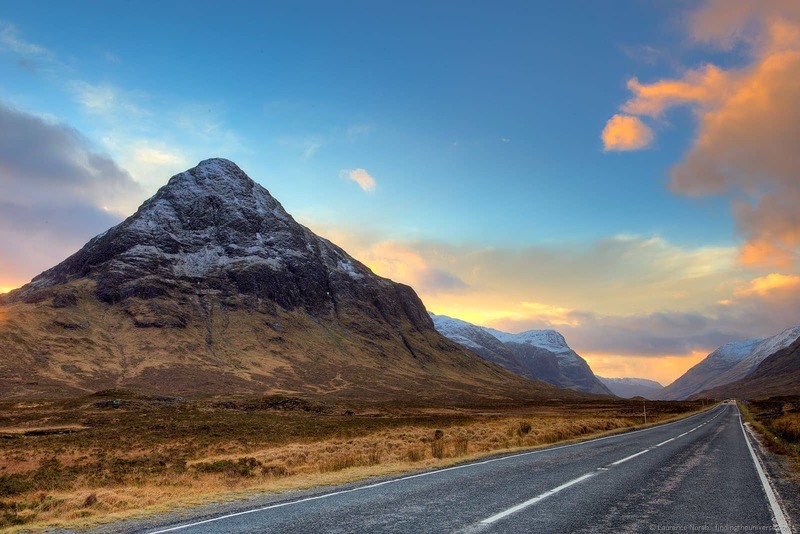 We also have a guide to escaping the crowds on the Isle of Skye, as well as a suggested 5 Day Isle of Skye and Scottish Highlands itinerary. We have a lot of content on Scottish cities too. 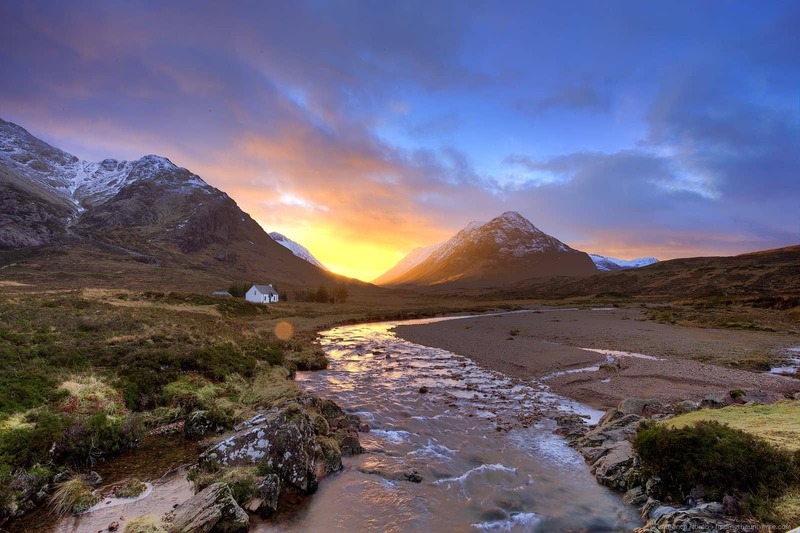 We have a guide to the best photography locations in Edinburgh, best things to do in Edinburgh, things to do in Glasgow, and things to do in Aberdeen – to name but a few! We also have lots of photography content to help you improve your photography. 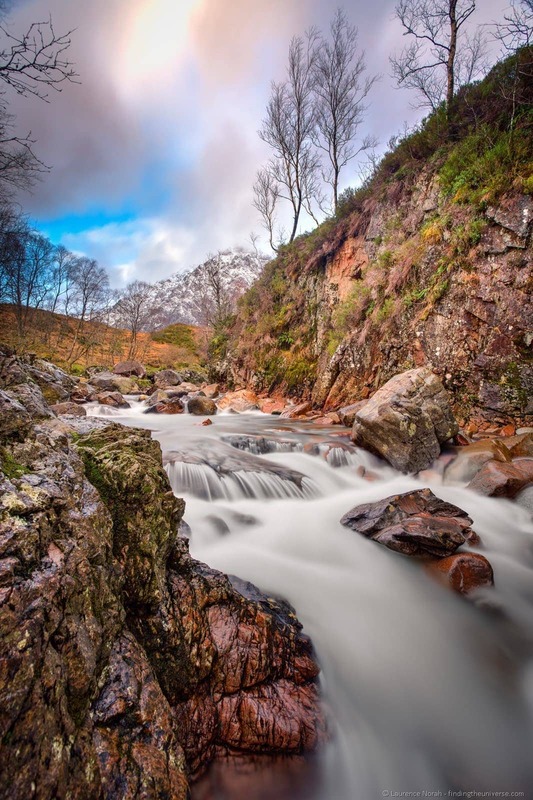 Check out our guides to lens compression, long exposure photography, RAW in photography, use of ND filters, depth of field and composition, to name but a few. Finally, if you want to improve your photography overall and get one-on-one feedback from me as you do, you can join 1,000+ students on my travel photography course. 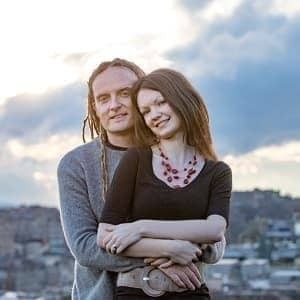 I’ve been running this since 2016, and have helped lots of people take their photography to the next level. Including learning how to use photo editing software properly! And that’s it! As always, we hope you enjoyed this post, and we’re always happy to answer your questions in the comments below. 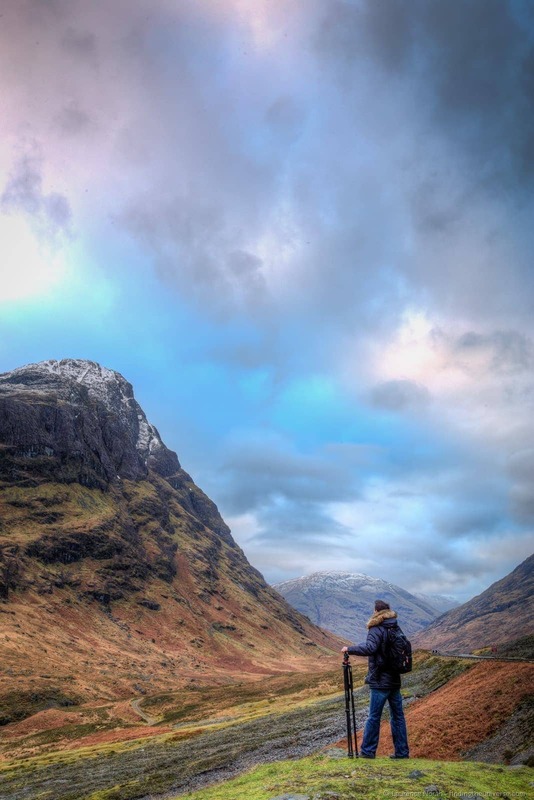 My trip to Glencoe was part of Edinburgh’s Hogmanay and was supported by ETAG, EventScotland, VisitScotland, Homecoming Scotland 2014 and co-creators Haggis Adventures. Created and produced by Unique Events. As always all opinions expressed here are entirely my own. 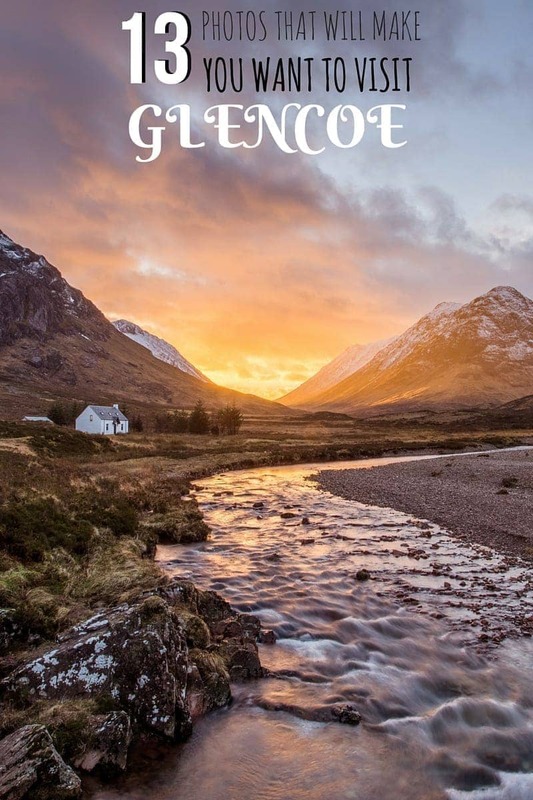 The white cottage is just off the main road through Glencoe – parking is here: https://goo.gl/maps/dAS4tJGEJS92 – the cottage is directly south on the other side of River Coupall.